When Eric Bowen is laid off, the Bowen family are forced to look for a new home. What initially appears to be the best option in their price range, is in fact a home haunted by a large number of malevolent entities. These ghosts have their eyes on the youngest daughter Madison, and when she is kidnapped and taken to their domain, the Bowen's son Griffin is forced to face his numerous fears to help bring her back. Just to get it out of the way: The Poltergeist remake is not one of small group of movies better than the original. It doesn’t seem like saying much to me, but people need to hear it before any discussion of this movie can begin. 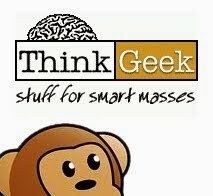 One thing you’ll learn about me as I review movies is that I have nothing against remakes in principle. When I hear a movie is being remade, I don’t ask ‘why?’ but instead I ask ‘who?’. It shouldn’t be a shock to anyone that, like most Hollywood pictures, remakes are green-lit by the studio with the express intention of making money. You can be equally as cynical about the latest superhero movie, Nicholas Sparks adaptation, female starring comedy vehicle and found footage project. When Dracula and The Three Musketeers are your favorite novels as a kid, the notion of stories being told over and over again is pretty normal. News of a Poltergeist remake didn’t fill me with rage, and news of Director Gil Kenan handling the project and Sam Rockwell being cast as the father actually made me somewhat optimistic. Making his Directorial debut with Monster House, Gil Kenan had shown an understanding of what it’s like to be a scared kid, and the value of making horror movies that are relatively safe for children. For myself (and I would bet many people, given its PG rating) the original Poltergeist was the first horror movie I ever saw and it scared the heck out of me. 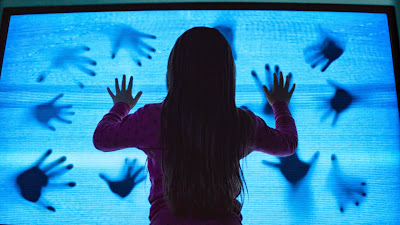 It will always remain an incredibly important film to me, but I look to the new Poltergeist thinking of the eight year old kids settling down with their family and their popcorn this Memorial Day weekend. And I think Gil Kenan has made a movie that is going to talk to those eight year old kids, and scare the crap out of them. Like the original, 2015’s Poltergeist presents us with a flawed but believable family. Their credit problems and arguments aren’t things that the family have to overcome in order to escape this ordeal. When Eric comes home early on with a number of gifts for his family, we can empathize with the disapproving look from his wife Amy (played excellently by Rosemarie DeWitt, just one of many strong performances here), but we can also empathize with Eric when he says “We need this.” Because they do. Most movies would drag this out into a conflict, as they would Eric and Amy’s failed attempts to find time for each other, but here it’s just a small thing that the Bowens overlook to work together as a team through hard times. 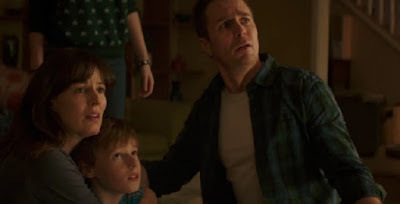 The most important thing a movie like this needs to get right is the central family, and the cast and crew of Poltergeist absolutely nailed that integral part of the story. It was always one of the biggest strengths of the original film, and while the Bowens are not the Freelings, they are as believable and as easy to relate to. Something else that was integral to the success of the original movie was its sense of humour. Far from being a horror comedy, that light-hearted sensibility was still a key part of the formula, and the balance feels similar here. A scene featuring an unexpected late night intruder was especially memorable and had me laughing out loud. Credit again goes to the cast and crew for succeeding at recreating another part of the magic that made the original work. 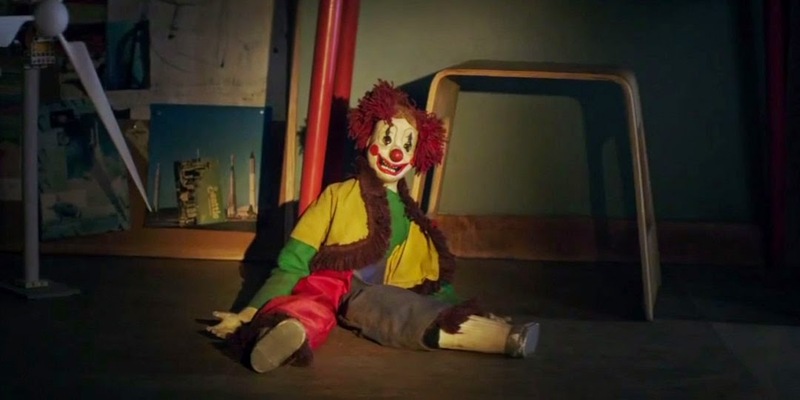 As things turn towards the supernatural and scares come into play, many of the same tricks the original put to good use are brought back (and given that the original movie still works with audiences, it’s no surprise the reused scares are still effective). In particular, I thought the heavily marketed clown was unique enough while honoring that ever so scary clown from the original. 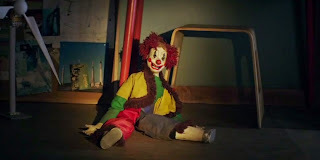 His pull cord nose is used in a number of creative ways that definitely sent shivers up my spine. One new effect I especially enjoyed paid homage to the glowing balls of light seen at various times in the original. Here we see the glowing plasma of various light bulbs in the house escape from the light fixtures and float around. Less impressive were the obviously CGI decaying corpses popping out of the ground at various moments. The original famously used real skeletons, and perhaps from fear of the ‘curse’ purportedly sparked by this desecration, the remake does not. For a film that used a lot of practical effects in other places I found it a strange choice. It’s not as if those sequences from the original look dated. The broad strokes of the remake follow the same plot of the original. 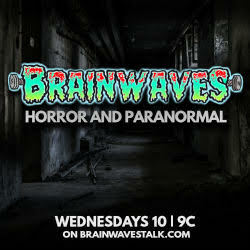 The ghosts become more and more active before the inevitable kidnapping, and with the suspects being Poltergeists, the Bowen’s turn to local paranormal investigators rather than the police. When the amateur ghost chasers find things to be more than they can handle, they bring in an expert. It would have been a huge mistake to try to recreate Tangina from the original Poltergeist, and the filmmakers make no efforts here. Jared Harris plays the psychic Carrigan Burke, famous from his TV show and known for his catchphrase ‘This house is clean’. In a good example of Poltergeist’s lack of cynicism, he isn’t there with his TV crews trying to extend his fame. He doesn’t bring the cameras because the Bowen’s don’t want him to, and he helps them because they need help. No other reason. Again, the heart of the original film feels preserved here even if Carrigan stands no chance of being as interesting a character as Tangina. One detail some might like, that I could have done without, were some unnecessary call backs to the original film. Carrigan’s catchphrase feels a little overplayed, and when the Burke’s find out that their home was built on the site of a cemetery, one guest comments ‘It’s not like it was an old Indian burial ground’. It’s a cute line, but one that for me only served to remind me that this movie was a remake, and it took me out of the story for a moment. 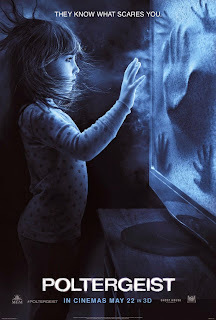 As Monster House had been a really fun 3D movie, I felt it wise to see Poltergeist in 3D, and I reasoned that the feature would be something to help the remake stand out a bit more from the original. The added dimension was put to a subtler use than you might expect, given the opportunity poltergeists provide to throw objects at the viewers, but I felt a degree of subtlety was appropriate. Too many such gags start to distract from the reality of the film, and less is often more when it comes to such things. Of all the sequences in the film, the one where I think 3D added the most was during our trip into the "other side"' as Griffin pilots his camera drone (bought during that aforementioned shopping spree) to try and get eyes on his sister. It’s a striking and creepy sequence and probably the high point of the movie. All in all, the Poltergeist remake tells a similar tale to the original, focusing on a different, but similarly likeable family. It’s still significantly creepy for a family movie (and let’s not forget, that the original was also a family movie) and captures the funny and charming qualities of its namesake. In my eyes, it’s worthy of carrying the franchise’s name, and doesn’t feel like a manufactured product like some remakes can. Care has been taken here. Thought has been put into who these people are while the director brought his own style and touches to the movie. If the thought of a Poltergeist remake isn’t over-ridingly offensive to you, I am more than comfortable to recommend it. The original will always be near and dear to me, and this remake will never replace it, but I still really enjoyed it. Somewhere out there, is at least one young kid who was just scared like they’ve never been scared before by this movie, who will grow up a horror fan as a result. That thought puts a big smile on my face. Franchise familiarity and greed have greenlit a movie that had no business being made. I enjoy emotional responses that lack substance. Let’s have a look at some real data, some facts if you will. The original Poltergeist in 1982 was #3 opening weekend grossing $6.89 Million. 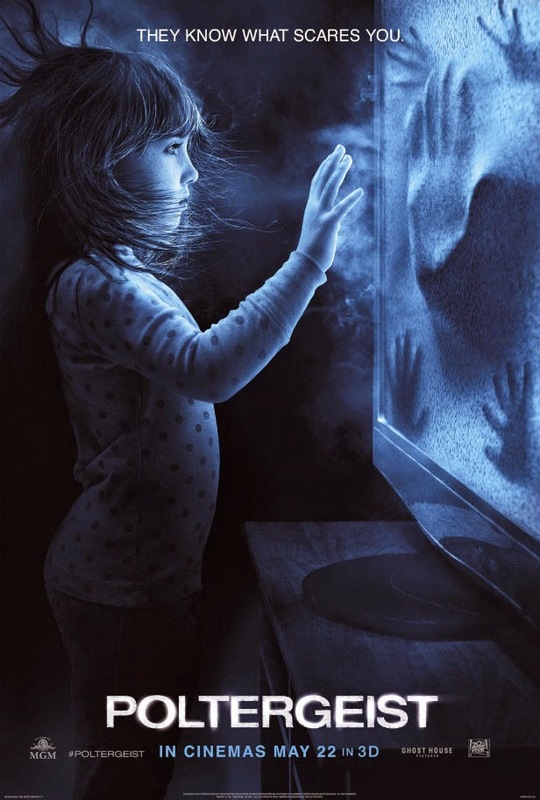 The 2015 Poltergeist remake was #4 opening weekend grossing $22.6 Million. Now before you run around yelling "1982 dollars are worth 10x today” let’s look at the CPI Inflation Calculator for some more facts. $6.89 Million in 1982 translates to $16.9 Million in 2015. That said the movie that you claim "had no business being made" earned $5.5 Million more opening weekend. I would argue that a remake that provides a 32% earnings improvement over the original has plenty “business” being made despite the fact that a small number of people will have their feelings hurt by it.